The Benedictine church of San Giorgio Maggiore, a masterpiece by Andrea Palladio begun in 1566, occupies its own island in the Venetian lagoon near Saint Mark’s Square (Bacino di S. Marco). The church features prominently in the work of Canaletto and his Venetian contemporaries who specialized in city views, known as vedute. 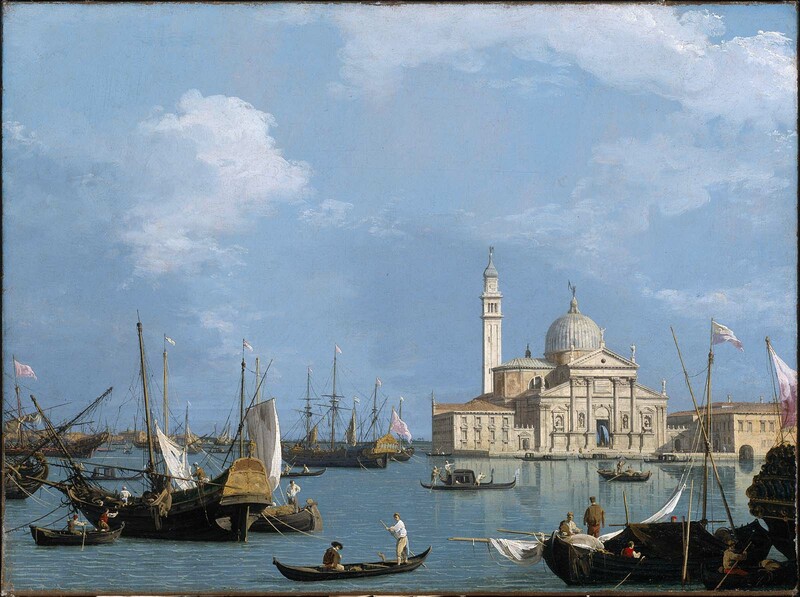 Canaletto carefully composed the various elements of the painting, framing the composition with picturesque clusters of boats. For further discussion of the provenance of this painting, see Peter C. Sutton, "The William Appleton Coolidge Collection" (Boston, 1993), cat. no. 11, pp. 63-65. While it is thought to have been acquired by Prince Joseph Wenceslaus in the 18th century, the painting cannot be securely identified in the princely collections until 1873. Its companion, depicting the Grand Canal, Venice, from Santa Maria della Carità (sale, Sotheby's, London, May 30, 1991, lot 61) remained in the Princes of Liechtenstein collection until 1948.